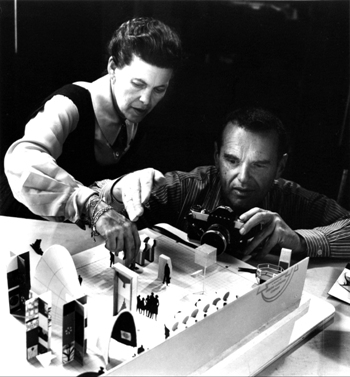 Husband and wife, Charles Eames (1907-78) and Ray Eames (1912-88) were the most talented and influential creative designers of the mid-20th century. Not only did they transform furniture with their unique mid-century plywood and fiberglass chairs still sold today, they also excelled in redesigning photography, filmmaking, interiors, multi-media exhibits, graphics, games, and corporate images. Jason Cohn and Bill Jersey have created a fascinating documentary about Charles and Ray Eames (nee Bernice Alexandra Kaiser) — the first one since their deaths. Combined with James Franco’s narration, the film’s interviews, archival photos, TV appearances, clips from Eames films and scenes of their “futuristic” IBM Pavilion at New York’s 1964 World’s Fair make the complex personalities and talents of Charles and Ray Eames come alive. Co-producer Bill Jersey has been producing documentaries for broadcast television for more than 40 years. One of the pioneers of the cinéma-verité movement, he had made award-winning documentaries for all of the major networks and in association with many PBS stations. Although “Eames: the Architect and the Painter” is his first feature documentary, co-producer and writer Jason Cohn has produced segments for PBS programs and has written documentaries for National Geographic and PBS. I met with Cohn on November 9, 2011. “Charles Eames was an autodidact, a self-starter from humble mid-Western beginnings,” according to Cohn. “He never let the lack of formal training prevent him from doing anything.” Charles Eames attended architecture school, but he never earned a license. Cohn continued, “Eames never learned graphic design.” He went on to tell me about an incident in which Charles Eames worked with a graphic artist on an exhibition of some kind. Eames insisted that all signage be written in bold capital letters, thinking the signs would be easier to read that way. Finally, his colleague told him about the readability of normal sentence case, the combination of initial capitals and lower case letters. This was news to Charles Eames. Ray Eames, on the other hand, was a serious abstract expressionist painter who studied with Hans Hofmann in New York. Ray and Lee Krasner (wife of Jackson Pollack) were colleagues. One of Ray’s paintings is in the permanent collection of The Whitney Museum of American Art. A renowned colorist, Ray Eames is responsible for numerous iconic designs of the 20th century. Cohn described how he first learned about the Eames. A friend gave him a DVD set of the Eames films, with more than 100 shorts including “Powers of Ten.” Cohn was hooked. He then made the connection to the Eames chairs and the couple’s additional major contributions to modernism. “Eames: the Architect and the Painter” is a remarkable film that shouldn’t just appeal to architects and designers. Because of the documentary’s skillful and perceptive writing, filming and editing, the uninitiated will enjoy discovering this intriguing couple’s life and work during their career spanning more than 40 years. For the 1950s, they had an unconventional marriage and worked as equal partners, the public’s focus on Charles Eames notwithstanding. Salient interviews with daughter Lucia Eames, grandson Eames Demetrios, critics and historians are included. Yet it is the former junior designers at the Eames’ studio in Venice, Calif., known as the “Eamery,” who give us the most candid and vivid picture of the Eames’ complicated personal and multifaceted professional lives, as well as the dynamics of the team and their unrelenting workload. Charles and Ray Eames launched their studio with a utopian working philosophy: “The best for the most for the least.” Their goal was to make high-quality, low-cost products using easily available materials. They pared down furniture and other objects until the artistic yet seemingly simple forms shone through. “Eames: the Architect and the Painter” rightly celebrates the way in which this genius couple helped transform 20th century art and design.